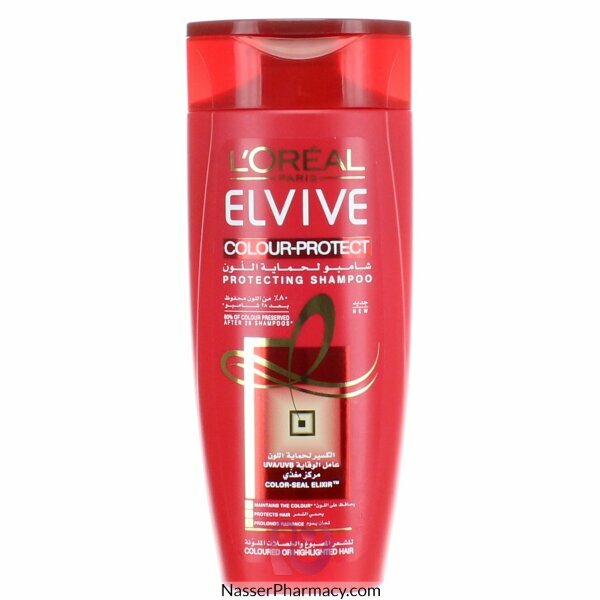 Elvive Colour Protect shampoo nourishes hair from the root to tip, maintains the colour intensity, protects hair UVA/UVB filters so that the shade of the colour is preserved, and prolongs colour radiance. For up to 85% more colour radiance* and 7 weeks colour protection**. *Instrumental test after application of shampoo and masque vs. Classic shampoo. **Instrumental test after application of shampoo and conditioner. Colour Protect’s new formula with an active ingredient boost leaves hair feeling nourished, your shine intensified and your colour radiance accentuated. Enriched with UVA/UVB filters that are known to protect hair from damage of UV-light; keeping the shade of the colour is preserved for a more vibrant color. The shampoo contains a nutritive concentrate which intensely nourishes the hair and smoothens the surface rejuvenating the hair’s brightness and prolonging it.